Go ahead and get case pricing while you mix & match. Imagine their faces when you serve up their favorite flavors. Each carton should yield about 50-1oz servings. If you charge $2 for each serving, you should receive around $100 Not bad at all. 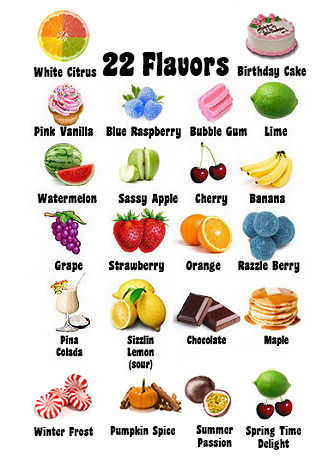 Available in 22 exciting flavors: Blue Raspberry, Orange, Lime, Pink Vanilla, Pina Colada, Strawberry, Grape, Cherry, Sizzlin Lemon (Sour) Watermelon, Maple, Chocolate, Bubble Gum, Sassy Apple, Banana Bonanza, Razzle Berry (Sour), Birthday Cake, Fall Spice (Cinnamon/Nutmeg/Ginger/Allspice), Winter Frost (Peppermint), Spring Time Delight (Cherry/Lime), Summer Citrus (Citrus/Passion Fruit) & White Citrus Passion.